Next week, November 24 – Dec 2, is National Social Inclusion Week so it seems like a great time to re-focus on the concept of inclusion. There is a lot of theory and jargon around inclusion and it can sometimes seem a confusing, ethereal notion. To me, once we strip everything else away, there is simplicity to it – it’s enjoying commonality and celebrating diversity. With everyone we encounter we will have differences but we will also have an overlap. The level of this will differ with each person but will always exist. We often have a fear of difference and this still presents a barrier to true inclusion. Social Inclusion Week is upon us! If you’re asking, what is Social Inclusion Week and how can I get involved? We’ll tell you! There are also places available for our Launch event next week…. Social Inclusion Week kicks off on Saturday the 24th November. To celebrate, Inclusion WA is having a BBQ! The second Inclusion Day encouraged students to get into after-school sports, with a little encouragement from some helpful volunteers. How healthy are people with an intellectual disability? What is being done to help people with an intellectual disability to get healthy and stay healthy? 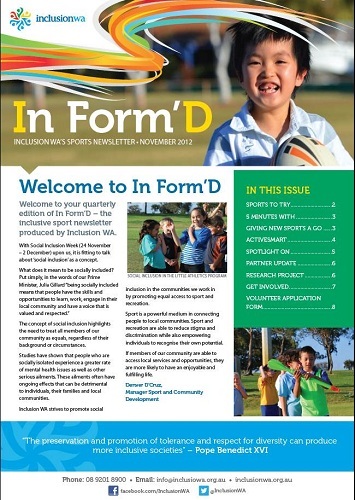 Stay up to date with the Sport and Community Development team with the latest edition of In Form'D! Peter is 26 years old and began the Rec Access Program in April 2012. He has a mild intellectual disability and experiences difficulties with his speech. When I first met with Peter, he would carry around a card which he could give to people he met which stated he had a disability and may take time to respond when asked questions. Prior to the program, Peter spent the majority of his time with his mum, dad and brother. He socialised with his brother’s friends, and he also attended a disability specific cooking group. He was always very polite and responded to questions, but never initiated conversation. Peter showed a keen interest in cars and mechanics and is also able to drive. Based on Peter’s interests, a model making group was found where Peter could build and paint model cars. We worked with the group to ensure it would suit Peter’s needs and we worked with Peter to teach him how to generate conversations with people. Through attending regularly, Peter has now made friends within the group and he has attended car shows (which are his passion) with a friend who he met at the group. Peter’s mother said that she has noticed a huge difference in Peter and his independence has increased dramatically. He now drives to the shops and local places on his own without his family, when he sees people he knows in his local area he stops to say hello (his mother said he never did that before) and his communication skills have improved greatly. He no longer uses the card to give people to say that he has a disability, which encourages him to initiate conversation with others that he meets. Peter has since been to a party with his new friends, and he has another one approaching, which is a fantastic achievement as he now has a new social network of friends that are separate to his brother’s. He also takes it in turns with his friends to visit each other’s houses. The Rec Access Program has had a huge impact on Peter’s life and he now has a social network of friends and a level of independence which he did not have before. Peter’s mother said that his life has significantly changed and he now has the skills to be able to interact within the local community. Hockey 4 All Coaching Sessions Come and learn some skills from qualified coaches. For ALL young people. Ability Level: Designed for young people who can walk with minimal assistance on an artificial hockey field. Also held 28th Nov & 5, 12 Dec.
Community Inclusion Workshop - Come and engage with other sector professionals and be involved in the conversation about supporting genuine community inclusion.